along with the picture design for the respective issue of the society's magazine The Marquetarian. for the older members of the Marquetry Society. 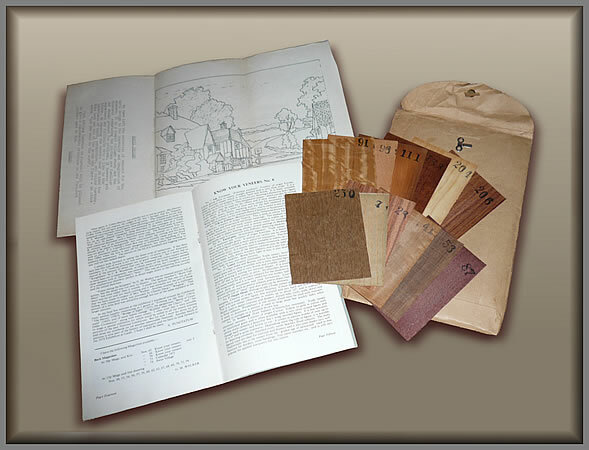 The veneer kit, original design, Marquetarian and envelope from Summer 1971. Issue number 75. These kits were made, by special arrangements with Art Veneers Ltd, for the Marquetry Society. The printed design drawings were numbered and keyed to correspond with the supplied veneers in order to help the marquetarians assemble those quarterly issued design drawings into completed attractive marquetry pictures.